GABRIELA, the largest and oldest existing women’s group in the Philippines, assailed the Department of Foreign Affairs (DFA) for issuing vague and irresolute statements on the diplomatic note it will send to the US to acquire custody over the case of the killing of Jennifer Laude by a US Marine in Olongapo City. “So far, the statement does not even pretend to assert Philippine custody, it seems to be merely suggesting it to the US. The injustice done to Jennifer does not merit such ambivalence and defeatism. The outraged citizens need to hear a stronger, more forceful assertion from an aggrieved country,” said Joms Salvador, Secretary General of GABRIELA. The DFA earlier said that while it will send a diplomatic note to the US to request custody, it does not necessarily mean that the US will agree to it. The group held a picket-rally in front of the agency to show their discontent with the way that it is handling the issue. The women-protesters are calling on the DFA to wield custody over the suspect US Marine PFC Joseph Scott Pemberton, part of the USS Peleliu marine personnel. They tied black ribbons with the call for justice. According to Salvador, it is high time for the government to scrap the Visiting Forces Agreement (VFA) which has been proven to place the country at the losing end by favouring the US. Salvador said that despite what Malacañang and the Mutual Defense Board would like to project, the crime greatly affects the future of the Enhanced Defense Cooperation Agreement (EDCA). “EDCA will increase the number of rapists and killers like Smith and Pemberton. They will be in each and every area where US troops will be allowed to stay, not just for a ‘visit’ but even for a much longer tour of duty. EDCA’s future must be put on the line after this incident. At the very least, the Aquino government must stop all negotiations related to EDCA immediately,” Salvador said. 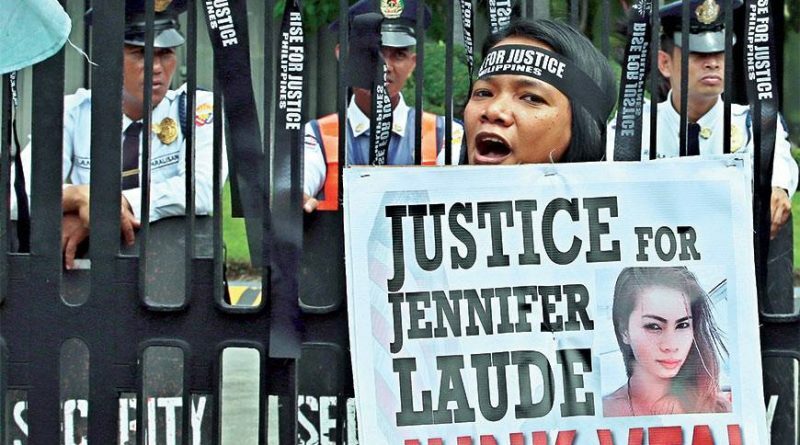 GABRIELA plans to hold more actions in support of Jennifer in Manila and in Olongapo City, to help the family seek justice, as well as to push for its demand to junk the VFA and scrap EDCA.